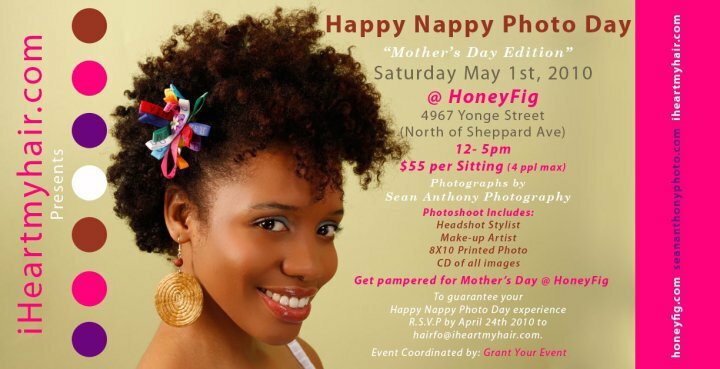 Toronto folks: Treat your mom to a Happy Nappy photoshoot! Pamper yourself for mother’s day at HoneyFig on May 1, 2010 from! Photos will be taken by photographer Sean Anthony (seananthonyphoto.com). There will also be a fabulous make-up artist and headshot stylist. An 8×10 printed photo will be prepared as well as a CD of all photos. Previous Post Side-eye of the week: Nightline Face-off: Why Can’t A Successful Black Woman Find A Man? Thanks so much!! That sounds great. Let me talk to my mom and my sister and see what days we can do this.